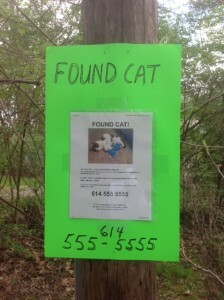 Posting flyers is one of the best known and most effective methods of getting the word out about a lost or found pet. Unfortunately, people in distress often create flyers in great haste with the result that their flyers omit critical information and are poorly designed. By using the Pet FBI flyer template you can design effective flyers. Print as many 8 1/2 by 11 flyers as practical. If you cannot print them in color then print your flyers on colored paper. Yellow is said to be the most visible color from a distance and likely to attract more attention than plain white paper. We recommend that you also create at least five to ten special flyers to attach to utility poles at major intersections near where the pet went missing or was found. Use a black indelible marker for the critical information. Attach the flyer to the pole using nails and duct tape. 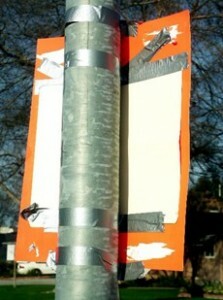 Use at least four strips of duct tape to secure your flyer to the pole. Photo courtesy of Missing Pet Partnership. To secure flyers that do not have a poster board backing, just wrap clear wide shipping tape to encircle the pole. If you run the tape over the critical information on your flyer, that’s a good way to weatherproof it, though a sheet protector is preferable. 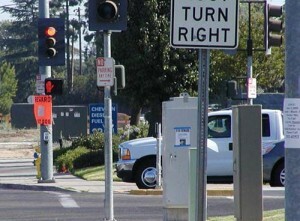 Note how the neon poster board draws attention amidst the usual welter of signage at a typical big intersection. TIP: Be sure to check our humongous national database of lost and found pets. Your pet may already be listed. 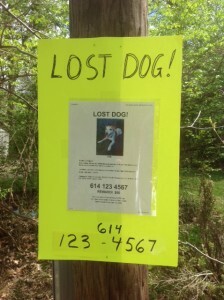 You can also post your own lost or found pet report. There is a lot of controversy about this! Party on the Patio for Pet FBI!